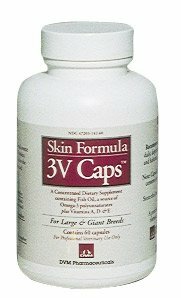 3V CAPS provide a supplemental source of *omega-3 fatty acids plus vitamins A, D and E which are beneficial for the maintenance of healthy skin and coats in large and giant breeds of dogs. Directions: For dogs 60-90 lbs: 1 to 2 capsules daily. Note: Capsule may be punctured and liquid contents squeezed onto food, if desired. *Not recognized as an essential nutrient by the AAFCO dog nutrient profiles. I see a big change in my dogs. No more scratching and less shedding.